About 90 eighth-graders from three Catholic elementary schools: All Saints of St. John Vianney, in Wickliffe and St. Adalbert and St. Aloysius, both in Cleveland, spent the morning of Feb. 26 learning about the Holocaust. The three-hour Face to Face Holocaust Education Program, part of Kol Israel’s Holocaust education program, was presented at Congregation Shaarey Tikvah in Beachwood. See the full story on the website for the Catholic Diocese of Cleveland. Click on the newsletter image below to open the full newsletter in .pdf format. MANSFIELD – Ben Nebel couldn’t speak about the horrors he was a part of during the Holocaust. Now, his daughter, Ellen Jacob, wants to make sure that his heroic story is heard. 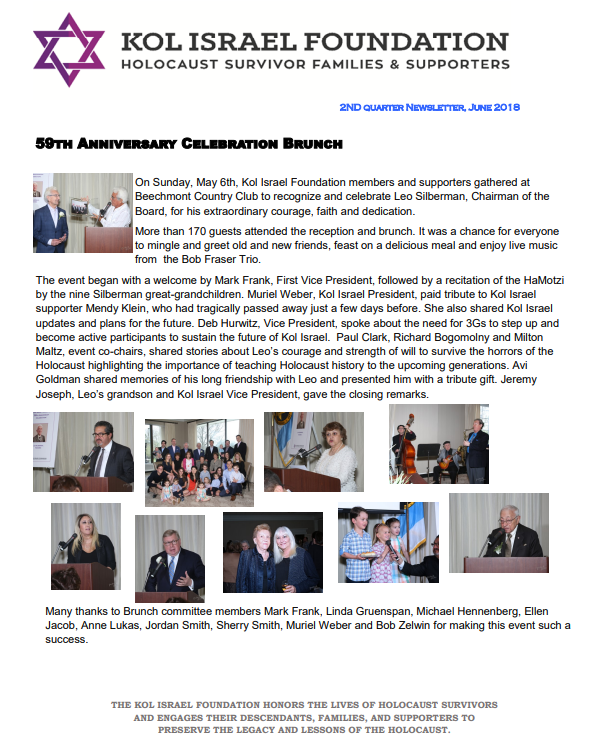 Jacob, vice president of Kol Israel Foundation and chairperson of Holocaust education outreach programming for the Beachwood-based organization, was the guest speaker April 23 at the Yom Hashoah commemoration at Emanuel Jacob Congregation in Mansfield. “Because I’m the daughter and granddaughter of Holocaust survivors, I’m not only a witness, I’m a very lucky witness,” she said. About 9 million Jews lived in Europe at the time and 6 million were killed in the Holocaust. During the Holocaust, Sam and Ida Zelwin belonged to the Bielski Partisans, a group led by Jewish Polish brothers who saved and recruited Jews in Belarus. After the war ended, the Zelwins settled in Cleveland. The 2008 film, “Defiance,” which chronicles the story of the Bielski Partisans, will be shown at 4:30 p.m. on Dec. 11 at the Mandel Jewish Community Center’s Stonehill Auditorium, 26001 S. Woodland Road in Beachwood. The movie night will include special guests Harry, Robert and Ileen Zelwin, who will discuss their parents’ experiences and answer questions. RSVP required by Dec. 8 to info@kifcle.org. Read the brief from the Cleveland Jewish News. BEACHWOOD, OH, November 21, 2016 – There were six million Jews murdered during the Holocaust, leaving a mere three million Survivors, each with a unique story to tell. One such story is the movie DEFIANCE -- an amazing, true story about human courage, perseverance, and strength during the most horrific of times. The 2008 film, directed by Edward Zwick, is set during the occupation of Belarus by Nazi Germany. It is an account of the Bielski Partisans, a group led by Polish Jewish brothers who saved and recruited Jews in Belarus during WWII. What makes this showing of the movie Defiance all the more compelling is that two of the Bielski Partisans, Sam and Ida Zelwin, settled in Cleveland, OH after the War. Sam and Ida Zelwin escaped from the Novogrodek, Poland ghetto at the latter part of 1941 after 5000 of their fellow Jews were taken into the forest and killed. The Zelwins fled into the Belarus forests where they joined up with the Bielski brothers when the group numbered two dozen people. They spent three and a half years resisting the Nazis with the Bielski Partisans until they were liberated in 1945, when the group numbered 1200. Today there are more than 20,000 descendants of the group. Sam and Ida had a son, Harry, who was born in a Displaced Persons Camp in Foehrenwald, Germany in November, 1947. After emigrating to the U.S., Robert was born in Cleveland, OH in April, 1950, and Ileen was born in February, 1952. Sam and Ida Zelwin died in January, 2005 and March, 2006, respectively. Special thanks to Robert Zelwin, Board Member of Kol Israel Foundation, and his family, second- (and –third) generation Survivors, for graciously making this movie event possible. Open to the community by reservation only. Admission is Free. Space is limited, so please RSVP by 12.8.16 to: info@kifcle.org.